MALEFICENT was one of the great animation triumphs for Walt Disney in 1959 when he spellbound a generation of boomer kids on the big screen with her visage in Sleeping Beauty (not forgetting that dragon! ), and they dutifully passed her delicious evil onto their children when the age of video replaced the days of drive-in. 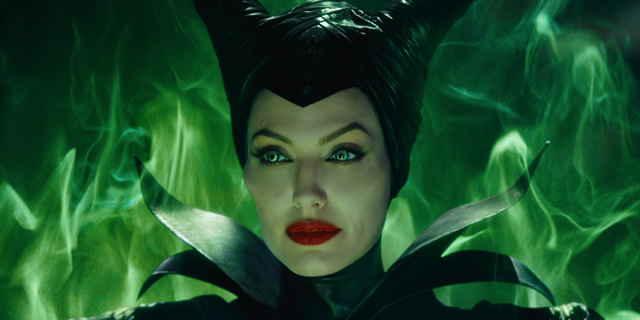 One tot, born in 1975, was part of that second batch and she grew up into one of the industry’s biggest stars, who makes the mighty Maleficent vividly hers in this 2014 megahit. 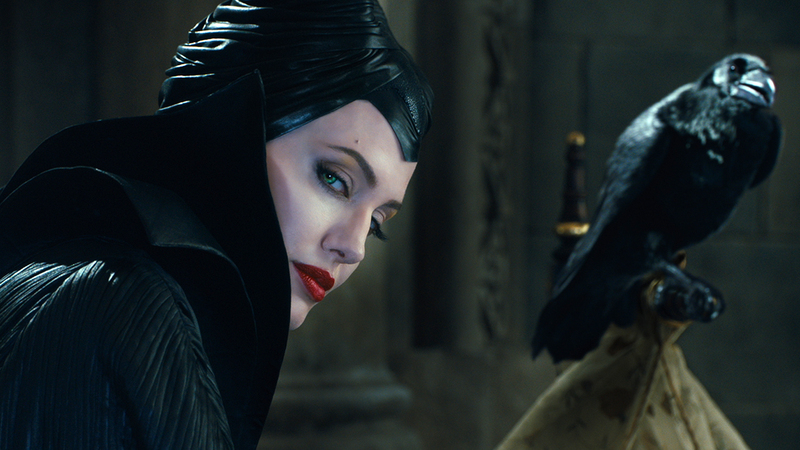 Angelina Jolie was born to play the part, and she is nothing less than perfect. It’s a regrettable given that actors in fantasy/sci-fi & horror films are almost never given their due at awards time, or even when people muse about ‘great’ acting, as the genres are considered dramatic trivia, poo-poohed as kid-stuff. So, wonderfully good work like that of Jolie’s brains & beauty competitor, Charlize Theron in Snow White And The Huntsman, or Will Smith in I Am Legend, Anthony Perkins in Psycho—it’s a long list—only rate mention when talking about the specific film. The rare breaches of the snoot wall—nominating Sigourney Weaver in Aliens, Ian McKellan in The Lord Of The Rings, actually giving Best Actor to Anthony Hopkins for The Silence Of The Lambs— are smothered in the wake of the usual cue-applause, safely adult portraits of the physically disabled, alcoholics, dead royalty or Holocaust survivors. Is Jolie’s work here better than Julianne Moore’s Still Alice or Reese Witherspoon’s Wild? No, but it’s just as good, with less depth of material to work with. Her every look, gesture, and vocal inflection puts over this basically preposterous creation and gives credibility to the character’s pain, power, venom and relish. The scream of anguish she releases during one key scene is as piercingly felt as that from Naomi Watts in The Impossible. 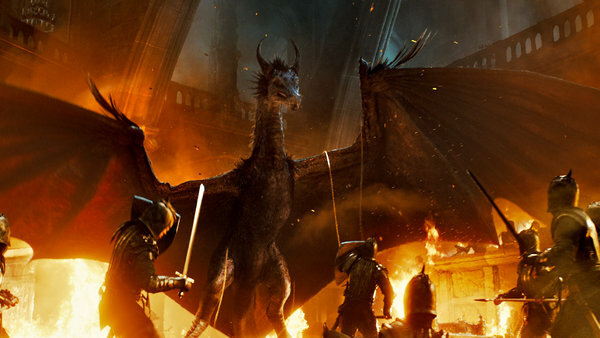 Great makeup (Rick Baker to the rescue again), and superb lighting help, and she’s backed by lovely CGI work, a festival of art direction and production design. Costume Design was Oscar nominated. The 97 minutes is about right for the telling here, effectively handled by first-time director Robert Stromberg, marshalling $180,000,000 worth of dazzle. 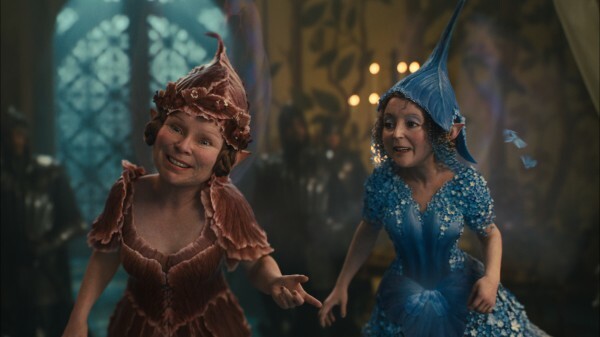 Having fun as pixies: Imelda Staunton, Juno Temple and Lesley Manville. Other casting is just okay: Sharlto Copley, Elle Fanning, Sam Riley. Music score from James Newton Howard is standard overdone ooh-aah blaring. Thematically, the script perhaps wants to have it too many ways and that left critics divided on the movie, but unanimous on the star. The public, worldwide, ate it up, racking a massive $758,000,000.